If you are a strong swimmer and enjoy helping others, working as a lifeguard could be the perfect job for you. A lifeguard is responsible for the safety of swimmers and other people taking part in any type of water sports such as canoeing or sailing. Depending on your particular lifeguard job, you could be working indoors or outdoors, supervising a swimming pool, the sea, lakes and anywhere else where water-based activities take place. Obviously, lifeguarding is specialised work that carries a lot of responsibility, so students who apply for any type of role in this field must be qualified, a competent swimmer, and also enjoy being around water. Being a lifeguard is also seen as a sport as well as a job and there are lifeguard competitions, similar to Australia’s Ironman events, around the United Kingdom on a regular basis. If you are interested in this type of work (or sport, even) and you are a student, you could well be studying at a university that has a life saving club. Why not join your university club, if you have one so you can meet like minded people and maybe even pick up tips about where you might find lifeguard vacancies. Check out the BULSCA (British Universities Life Saving Clubs Association) website to see if your university is a member and if it isn’t, why not set up a club and get your university involved. They hold inter-university competitions and organise and run the British University Life Saving Championships. Where Could I Find Student Lifeguard Jobs? If you are interested in temporary or part time lifeguard jobs while studying, there are many different places where you could find possible employment. Obviously, your duties will differ depending on the environment you are working in, and you will need to have different skills and training for beach lifeguard jobs rather than swimming pool lifeguard jobs. Lifeguard jobs in local public swimming pools and swimming pools in private health clubs. If swimming pools are more your thing as opposed to natural water areas, swimming pool lifeguard jobs could be available in your locality. Public swimming pools tend to get busier through the summer holidays so you could find casual lifeguard jobs at your local council swimming pool. Also, if you have private health clubs nearby, check whether they have swimming facilities and you could find swimming pool lifeguard jobs there. Not all lifeguards work in swimming pools. 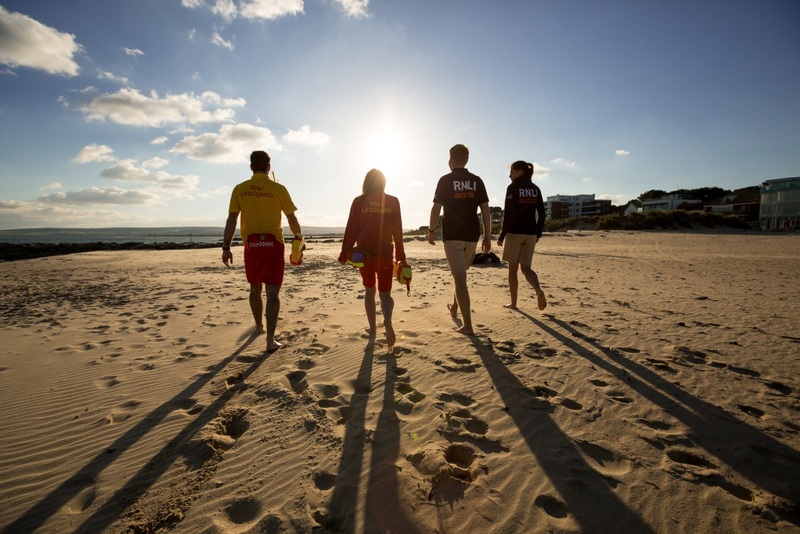 If the great outdoors is your thing, why not think about beach lifeguard jobs? This would be perfect for students who are at a coastal university or for those looking for temporary summer jobs. How do you fancy whiling away the long summer days with a beach lifeguard job, supervising sections of Britain’s coastline? Join the RNLI. We’ve written in length in the past about student theme park jobs. Theme parks can provide lots of exciting temporary summer opportunities for students as well as permanent full time work and part time jobs. The good news for those of you students who are looking for lifeguard job vacancies is, because this line of work is skilled and carries with it a lot of responsibility, lifeguards are in demand. This means you have a stronger chance of getting a job. Theme park lifeguard jobs could be in swimming pools or in lakes, depending on the theme. Increasingly, these days, theme parks are also offering hotel and leisure facilities and some will have a swimming pool in their health centre. Check out possible opportunities for lifeguard jobs at Alton Towers Resort, Thorpe Park or Chessington World of Adventures Resort if you live or study near any of those theme parks. Seasonal jobs for lifeguards are plentiful in many of the United Kingdom’s adventure camps or multi-activity day camps. Multi-activity day camps tend to spring up in time for the summer and Easter holidays when children are off school. Some companies even use the grounds of schools and universities for their sites, so you could find a life guard job without having to venture too far from your place of study! Read more about working in multi-activity day camps and adventure camps. And the good news is, these types of summer camps tend to offer flexible working hours so if you can’t commit to too many hours, you might be able to negotiate a casual lifeguard job which fits in with your other commitments. If this sounds like your thing - working with children of all ages - here’s a list of companies to get you started where you could possibly find summer lifeguarding jobs. As with the theme parks, you are in luck because lifeguards are always in demand. Check out seasonal jobs or more long term work opportunities with Camp Beaumont, SuperCamps, LL Camps, Barracudas, Isis Education or Churchill House School of English Language. If you are a gap year student and are looking for more long term work while you are taking time out from your studies, why not look for possible temporary full time lifeguard jobs at any of the United Kingdom’s Adventure camps and activity centres? These tend to be residential camps that focus on children and young people but some also take on special private groups such as stag and hen parties and corporate team building groups. At residential centres, you may be provided with food and accommodation as part of your pay packet. Also, because you are a qualified lifeguard, you will receive a higher wage than those who are working as general assistants to instructors. There are a few companies in the United Kingdom that run activity centres where you might be able to find lifeguard job vacancies. These wouldn’t just be swimming pool lifeguard jobs, but also, as these centres focus on adventure, you would also be responsible for the safety of people using the boating lakes or even rafting on the rapids. Obviously, you would need to be qualified in this but if you can get a lifeguard job here, it is a great way to increase your skill level as many of these centres will give you the opportunity for specialised training. Here are a few United Kingdom activity centres where you might come across opportunities for seasonal or long term lifeguard jobs: Acorn Adventure, Robinwood Activity Centres, The Venture Centre and X Keys. Some of these companies may also have opportunities for lifeguard jobs abroad. For example, Acorn Adventure has centres in European countries as well as in Wales. Lifeguard jobs abroad in European and US summer camps. If you like the idea of working overseas, then why not think about summer lifeguard jobs abroad in camps across Europe and the United States? Many young people love the idea of seasonal jobs in US summer camps so, as you can imagine, competition for placements is pretty high. However, as a lifeguard and someone who is competent in water-based activities, you are in high demand and should find it easier to land a job than someone who is applying for more entry level positions. You will also earn more! Read more about work in US summer camps. To find lifeguard jobs abroad in US summer camps, there are various agencies across the United Kingdom that arrange introductions, interviews and placements for you. E4S have compared these agencies and their fees to take some of the hard work away for you. Take a look at our comparison of US summer camp agencies. Seasonal lifeguard jobs in summer camps in the United States could be found with companies such as Wildpacks, Americamp, CCUSA and Camp Leaders. Lifeguard jobs on cruise ships. Many cruise ships have swimming pools on board so require lifeguards. Cruise ship lifeguard jobs tend to involve more than just lifeguarding so be prepared to help out with maintenance or assist with island visits when the cruise ship is not at sea. Find out more about cruise ship jobs here. What Would You Find In A Lifeguard Job Description? Obviously, life guard jobs carry with them a lot of responsibility as you are responsible for the safety of those in and around the water while they are having fun or carrying out different challenges. There could be times where you may be required to save someone’s life as well as carrying out your general supervisory duties and helping people in difficulty. A good lifeguard will make sure people are still having fun while being in a safe environment so while working in lifeguard jobs you will be confident in dealing with people of all ages and keeping them relaxed. It’s about prevention rather than cures when it comes to possible accidents around the water, so lifeguarding jobs involve good supervisory skills - being able to spot where a potential problem might occur - as well as being a competent swimmer. Further duties and responsibilities for lifeguards include carrying out rescues in various situations and, especially if you are working in an adventure camp or similar environment, your lifeguard job will involve the supervision of making sure participants are using equipment safely and correctly. Lifeguards are qualified in first aid and the role of a lifeguard includes carrying out emergency first aid procedures where necessary. Depending on where you work and the type of lifeguard you want to be, there may also be other responsibilities such as keeping the changing areas and swimming pool clean, checking chemical levels and making safety checks on pool and water sports equipment. Obviously, it is your responsibility to keep your lifeguard skills and qualifications up to date and refreshed. In house training for lifeguard jobs is commonplace so the more you work, the more you should build on your existing skills and experience. For those students looking for beach lifeguard jobs, there are different responsibilities - it’s not all just about sitting in an elevated chair, soaking up the sun. More qualified lifeguards will be required to use rescue boats, drive patrol vehicles and work as a radio operator. There are many different aspects to working as a beach lifeguard. For those without any skills or qualifications in this field but thinking lifeguard jobs look really fun and challenging, it does not rule you out of landing a job. Being proactive before you start to apply for jobs should set you off in the right direction. For example, if you are student thinking about pool lifeguard jobs, you can do a full pool lifeguard course in three days in the United Kingdom. This involves practical tests and also a written examination. Many companies operate in house training for these, meaning you could qualify while on the job. If you enjoy your work and want to take it further, there are further specialisations you can do such as life saving, open water rescue, swimming pool rescue, and eventually, the training and assessing of others. In the United Kingdom, awarding bodies for lifeguard qualifications are RLSS (Royal Life Saving Society, UK), HABC (Highfield Awarding Body for Compliance) and the Swimming Teachers Association. The RNLI (Royal National Lifeboat Institution) is the largest operator of beach lifeguards in the United Kingdom. They offer specialist courses for beach lifeguards and bodies that award the qualifications are the NaRS BL (the National Rescue Standards Beach Lifeguard Qualification) and also the RLSS who have a National Beach Lifeguard Qualification. For all lifeguard jobs, obviously, you will need to keep yourself physically fit so that you can get to areas at speed should you be called upon in an emergency. Also, you will be approachable and friendly when working with the public. On many occasions, particularly for work in summer camps and activity centres, you will be working with children and they need to feel safe and comfortable around you. What Are The Main Benefits Of Student Lifeguard Jobs? If you have always been confident in the water and have excelled in swimming from a young age, you may already have taken some basic qualifications; you might already have some RLSS qualifications. Because lifeguarding is a job that requires skills and qualifications, you have a good chance of getting a job. For example, we have already mentioned above about the stiff competition for student jobs in summer camps. As a lifeguard, you can stand out above that competition and get a post. And do you fancy the idea of working abroad, either in children’s summer camps or in holiday resorts? Your lifeguard qualifications could go a long way towards helping you achieve your goal of working overseas. Working in summer camps, activity centres and other similar environments means, traditionally, you are not paid a high wage. These jobs are more about making the most of the experience. However, for lifeguard jobs and other roles that require qualifications, you can at least eek out a little bit of extra cash from your employer as your hourly rate should be higher. Students who manage to get lifeguard jobs should find they will get on the job training so while you are working, you will also be building up your qualifications. There’s no doubt that working as a lifeguard gives a sense of worth and comes with lots of personal reward. This could be in the fact that you have saved someone’s life or something more simple, such as teaching a child to swim. Being a lifeguard is not just about lifesaving. You could be responsible for helping children to overcome their fears around water and water sports. Meet like-minded people and make new friends. This could be at a university club such as BULSCA that we mentioned above, or it could be other lifeguards you meet while working. You never know what other lifeguarding opportunities might come out of these friendships. And yes, we can’t leave out the old CV benefits. Any potential future employer can’t fail to be impressed by your lifeguard credentials. So you are now convinced you fancy a student job working as a beach or pool lifeguard. How do you go about getting that job? Be proactive: Get your CRB (Criminal Record Bureau) checks done before you apply for jobs. Chances are you are going to be working with children so you will need a valid certificate. While many employers will do this for you, you can stand out above your competition if you can show you’ve already got your certificate and are available to start work straight away. Check your qualifications: Make sure whatever qualifications you have are up to date. For example, when was the last time you checked your First Aid certificate? Any relevant written evidence you have of your experience or skills, get it all together in one place so you can impress on your application form or at interview. Think about who might need to employ lifeguards: Well, there are no excuses, here, are there? If you are looking for lifeguard jobs, we’ve given you lots of ideas throughout this article. Click the links, find out if there could be jobs locally or if there are opportunities for overseas. Find out the requirements of these companies and, more importantly, do your homework on when these companies recruit, especially if it is a temporary summer job you are hoping for. Make a note of the deadlines in your diary or set reminders on your computer so you don’t miss out. So what are you waiting for? Get your research done and go out there to land your dream student job, working as a lifeguard.